The day to day use of your fridge is usually manageable, but what do you do when the time comes for that big shop or you’re planning to be the host with the most but struggling to squeeze the cocktail sausages in-between the jam and last nights curry leftovers? Well we have the answer! (And no it’s not to buy a new one) Here are 5 ways to make the most of your fridge and free up some much needed space! It’s time for a fridge purge! Get your detective hat on and go through every item inside. Check the date and how long its been in there and chuck away anything that is past it’s best. General rule – if you can’t remember how long it’s been in there, chuck it out! And you know what will help you with your purge? You guessed it, labels! Try to label everything in your fridge. If its leftovers, mark the date of how long you can keep it, if you’re using containers, make sure you remember the expiry date so you don’t keep things for too long, taking up space or worse, causing unwanted smells! Food packaging is often larger than it should be and takes up valuable space. Reduce this by taking it out of the packet once opened and placing it in a smaller container. If there are fruits that can be put together place them in the same container to free up even more. 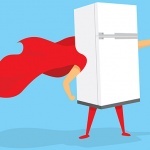 There are plenty of accessories out there to help you on your spacious fridge journey! Investing in a wine and bottle rack will save you heaps of shelf space and make you feel super organised. Some savvy space savers have been known to use a Lazy Susan in their so you can access all your condiments and never loose them in the back of the fridge again. Always check your fridge before you leave for your shop and write down a list of what you need. 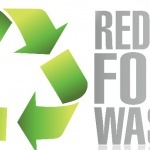 That way you’ll avoid overbuying and limit the amount of food you throw away. To make it quicker, you could even just take a photo of in the inside of your fridge before you head off on your journey. Foods such as bread, onions, tomatoes and garlic don’t need to be put in the fridge. If you’re struggling for space, make sure you know which things shouldn’t go in the fridge and what you could take out. To get you started, Good Housekeeping has a list of 9 things you shouldn’t store in the fridge. To reduce the amount of cleaning you need to do, line your shelves with plastic placemats or cling film so any spills or leaks can be easily caught and save you from the scrubbing! You can get seriously creative with this and give your fridge a snazzy makeover. Check out this idea from Home & Living. No one wants to open their fridge to be hit with a terrible smell! So keep it fresh with a fridge deodoriser. This handy little gadget will keep strong smells at bay and keep your refrigerator fresh and clean for up to 3 months! There’s plenty of talk about what goes where, so we’re here to set the record straight! 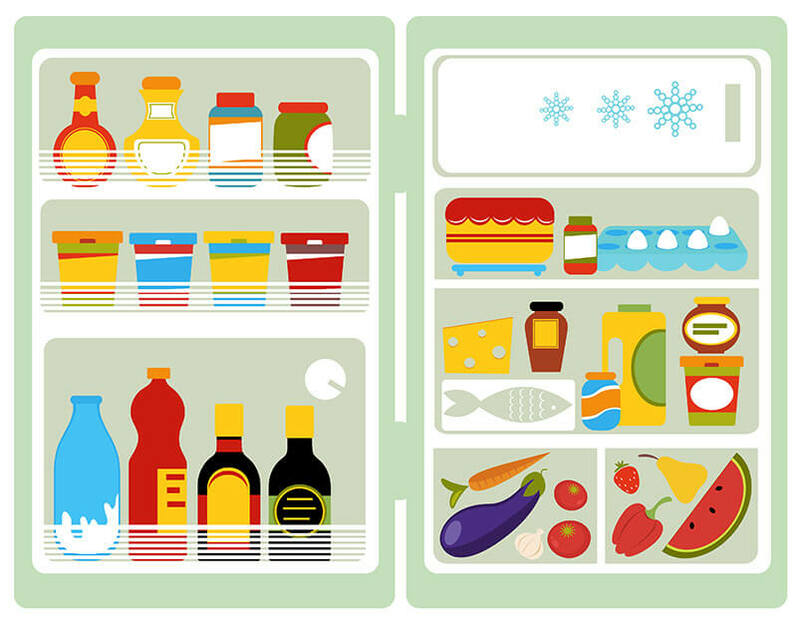 Here is our guide to organising your fridge to get the best out of your food and your space! Top – Ready to eat foods such as leftovers, drinks and herbs should be stored on the top shelves. Middle – Your eggs and dairy should be kept on the middle shelves and not in the doors. Fridge doors temperatures fluctuate all the time, so your dairy products could go past their best much faster. Bottom – Keep your raw meat and sea food in the bottom draws to avoid drips from contaminating other foods. Draws – Fruit, veggies and salads should be kept in the bottom draw. Be sure to wrap them in paper or plastic to prevent them from getting contaminated. Doors – Condiments, juices and water can be stored in the door as they are less likely to go off. Be sure to keep them balanced and don’t overfill so they don’t fall out when you open the door! For more handy fridge tips, check out these 10 ways your fridge can help you with household chores.